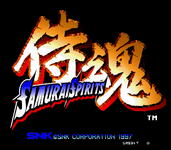 Samurai Shodown 64, known simply as Samurai Spirits (SAMURAI SPIRITS ～侍魂～ Samurai Supirittsu) in Japan, is a 3D fighting game produced by SNK for its Hyper Neo-Geo 64 system. It was SNK's first attempt to bring one of their franchises into the 3D realm. After having released four Samurai Shodown games on the Neo-Geo, SNK announced that they would be producing a new arcade hardware platform, this one 64-bit and with extensive 3D capabilities. Although it was never ported to home consoles, it was followed by a second 3D installment titled Samurai Shodown 64: Warriors Rage. The gameplay takes full advantage of its 3D engine, with the ability to move in any direction (in a fashion that was later modified and used in Namco's Soul series). It is also the first 3D fighting game to use multi-tiered stages (although Midway's Mortal Kombat 3, a 2D fighter, utilized this concept two years earlier), where it was possible to knock an opponent through a wall or floor into a different section of the same arena. This idea was later used in Tecmo's Dead or Alive series, which is frequently (and erroneously) credited for the innovation. It also makes use of the then-traditional setup of being able to knock an opponent out of the fighting area entirely, thus resulting in a victory by "ring out." Shiki, a swordswoman proficient in fighting with dual katana, who is later chosen as one of SNK's selectable representatives in the fighting game, SVC Chaos: SNK vs. Capcom and Neo Geo Battle Coliseum. All in all, the game was not received as well as SNK had hoped, so they sought to remedy the game's problems in the sequel, Samurai Shodown 64: Warriors Rage. Source: Wikipedia, Samurai Shodown 64 , available under the CC-BY-SA License.